The weather might be cold, grey and dreary – but our shops certainly won’t be. In 2019, retail displays are expected to follow the wider graphic design trends of vivid colours, strong typography and futuristic aesthetics. The start of each year can feel strangely anticipatory. As we semi-hibernate, thoughts turn to what the next 12 months will bring, rotating through the very different atmospheres and activities of winter, spring, summer and autumn. Innovation is never far from our thoughts, especially with recent advances in space discovery and the continual rise of mobile technology – so expect to see futuristic sharp lines, shimmering metallic textures and cosmic imagery bursting through at every opportunity. Geometric shapes, waves and asymmetrical patterns are also likely to be popular, meeting a desire to see something truly new, after many years of predictable, ‘safe’ digital stylings. 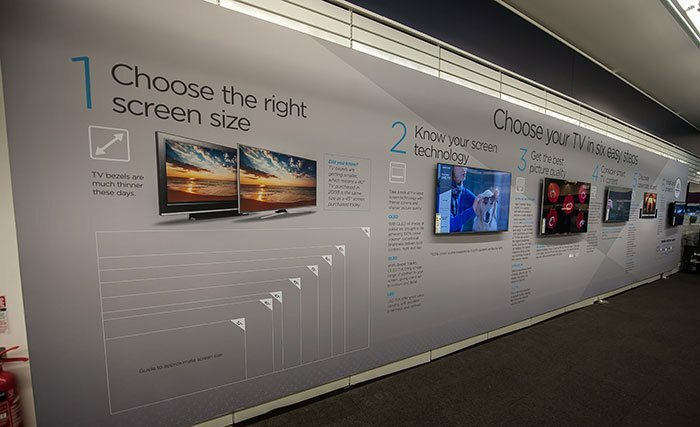 From window displays to point-of-sale messages, brand graphics are expected to reflect this movement. According to the experts at the Pantone Colour Institute, the most appealing colours will be bold reds, rich purples and bright oranges – evoking desires for pleasure-centre foods like spicy peppers, chocolate, fruit and desserts. Meanwhile, neutral shades including notes of coffee and grass will provide a refreshing contrast. These colours are to be found within eight Pantone palettes – two of which are titled ‘Cravings’ and ‘Classico’ – which form a selection of 72 colours for the year ahead. As our digital landscape becomes more cluttered, we lean increasingly towards minimalism in our physical environments, helping to calm the mind and capture attention. However, 2019’s minimalist style is likely to be punctuated with (neat) splashes of the bold, bright colours predicted by Pantone, providing a fresh new direction compared with the neutral minimalism of previous periods. Duotones and gradients are also likely to be popular, using the juxtaposition of dark and light colours to provide sharpness and depth. High-resolution print graphics will be vital to maximise the potential of such trends. Bespoke typography will become a focus for designers, with a careful balance to be struck between legibility and tonal creativity. Likewise, negative space is expected to become a greater priority, allowing greater clarity around messages and reflecting the preference for minimalist aesthetics. Authenticity will also thrive, with increasing demand for hand-drawn graphics and truly original designs. Meanwhile, customised text overlays may allow for the personalisation of otherwise straightforward graphics. If you’re keen to be up-to-date with 2019’s graphic trends, ask our retail design team about the range of display options we can devise and print for your business.